Overview: Automate your speakerphone ! Speakerphone Volume Control - A simple tool that allows you to control the speakerphone volume without any effort. When the speakerphone is turned on the volume will adjust to the preset volume automatically! Auto Speakerphone - Incoming and outgoing calls can be automatically routed through the speakerphone. Perfect for *near* hands free driving. Positional Speakerphone - Puts phone calls in speakerphone mode when the phone is placed in a preset position of choice. Two different positions can be set. *Speakerphone turns on but is not reflected on the speakerphone button. Widgets - Four useful widgets to help stay informed of which settings are active. 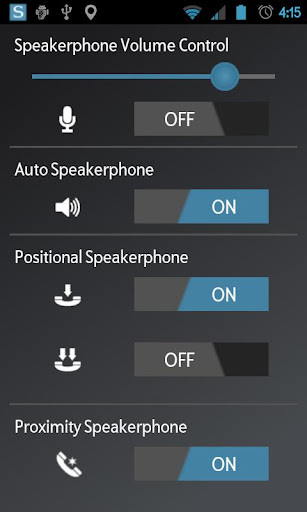 Option menu for volume adjustment, notifications and setting positions for Positional Speakerphone. Names can be given to each speakerphone position to display within the app and/or when the feature is turned on by a widget. Please exclude Speakerphone Control from any TasKillers. Android only provides one 'In-call volume' this app allows you to have two distinct volume controls, the regular phone volume and the speakerphone volume. This app has low battery usage, basically the application only runs during phone calls. Widgets naturally use more battery but only run for a fraction of a second, once every 2 days or when tapped. If you like Speakerphone Control please consider rating it.